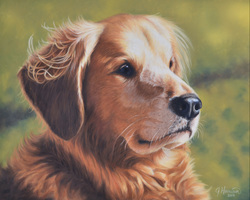 How do I commission a pet portrait? 1. Send me your photos! Scan original photographs, or email me as many digital files as you want. Learn which photos work best in my blog article. 2. Decide on a reference photo. We'll discuss which photos capture your pet's personality, and which will work best for your portrait. To view my sizes and rates, visit my rates page. Once all the details are decided upon, I will send you an invoice through PayPal for the total cost of your portrait. What kind of picture should I send you for the portrait? 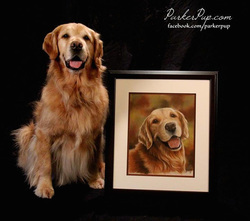 Check out my blog article about how to get the best pet portrait photos. 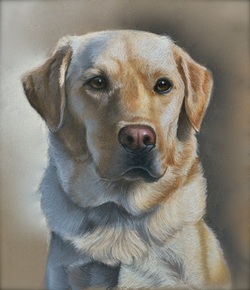 Does my pet portrait come with a frame and mat? The short answer here is no. The price you are quoted for is for just the portrait, no mat or frame. The portrait will have a .5 inch margin around the edge so that it can be matted properly. Mats and frames are not included in my services because each mat and frame should be chosen to compliment the decor in your home. Because all of my portraits are 100% custom with sensitive materials, I highly recommend having all artwork framed by a professional. While it may save a bit of money to buy a pre-cut mat and frame elsewhere, I can promise that the quality of the portrait will be preserved and protected much better in a professional frame. How should I frame/display my custom pet portrait? 1. You MUST MUST MUST frame your portrait AS SOON AS POSSIBLE to avoid damage and to preserve color vibrance. Letting your portrait sit out will allow the wax pigments to oxidize and dull the vibrant colors. 2. You MUST MUST MUST have a frame, with a mat, and glass. NO exceptions. The surface of your portrait will touch the glass without a mat, which can be very damaging. Glass is not an option - it will protect your portrait from, well, everything! 3. DO NOT touch your portrait if you don't have to - even on the edges. My custom portraits are done on archival paper, which means that the oils from your skin will stain the paper over time. To avoid this - don't touch it unless you're framing it. 4. Never ever stack anything on top of your portrait. How long will it take for you to complete my portrait? Be sure to check out my speed drawing videos of some of my pet portraits! Can you do a portrait of two (or more) of my pets together? Portraits with more than one subject work best if I use one reference photo, instead of having two separate photos to work from. However, it is still possible to use to separate photos.